with you for a few months now. or maybe something cold to drink as you browse along. Let's start with the before pictures, shall we? Can I just say how much I despised this bathroom? and primarily used by my kids...who are now teenagers. 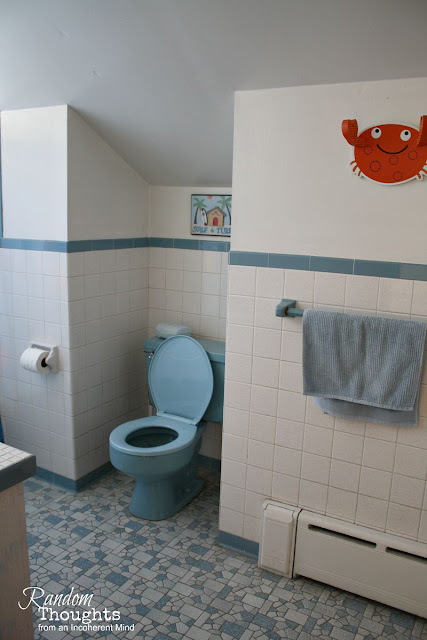 I loathe those blue fixtures! I can't get over my tendency to want to shield my eyes! The contractors came and gutted the place. Why such a mess you ask? 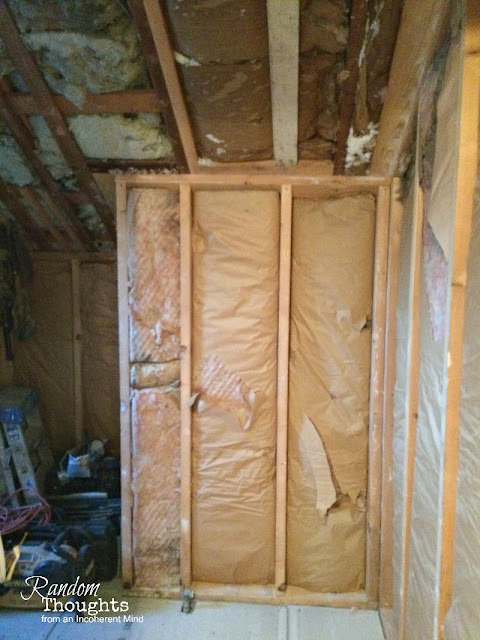 The walls were sheet rock...or so we all thought. house both upstairs & downstairs! I really could have cried. Thankfully, things starting looking up quickly. I fell in love with this gray wood look tile. the walls yet, but other than that, she's all done! from a few years back by clicking right here. Wow that shower is beautiful! That was a big job but it sure looks great. Beautiful! I love that tile. subtle color palette within your Upstairs Bathroom!!! I can feel your pain in your comments about the dust. . .
a 5 X 5 black grouted original tile entry!!! YUCK!!! You're going to be able to enjoy this make~over for years to come!!! Looks great Gina, your shower curtain is so pretty too! Love it Gina!! The tiles you chose are great and the whole room is so bright and cheery! Its been forever since I have done anything with my blog...nice to see you have been busy! take care my friend!! Gina I love it!! The tile looks beautiful and I love that light fixture!! Holy Mackerel Gina, What a fantastic transformation. Ugh on the dust. Our house is like that all the time, where we live is uncommonly dusty constantly, ugh. 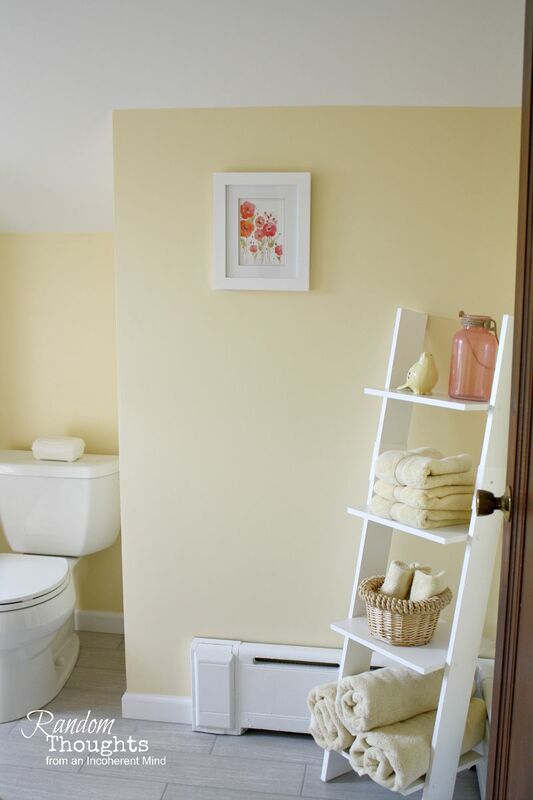 Love light soft yellow, so pretty and relaxing for anybody using room. OH would I love to have your wood look ceramic tile. Our house has lots of ceramic tile but not with colors I'd love at all. We have ceramic tile wherever there is no carpet, really don't like it. If anything falls it breaks for sure. grrrrrr. Love that ladder and your light fixture. I've been going galvanized goofy this year. 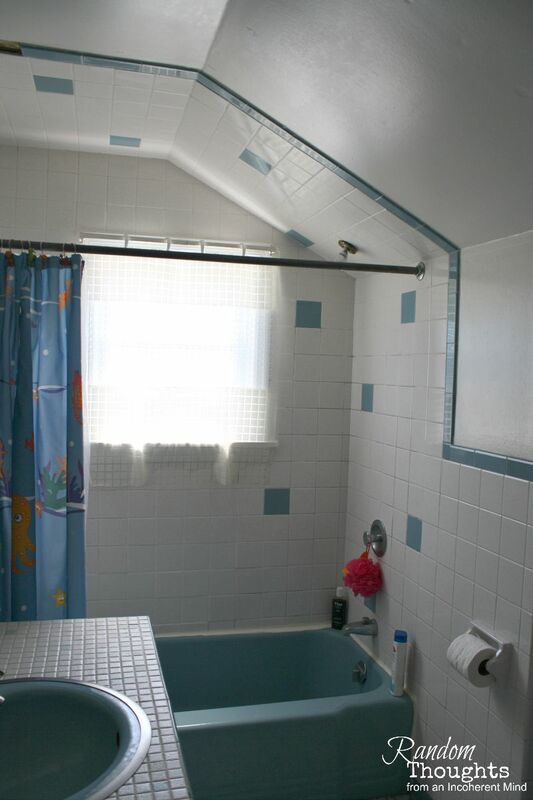 I can see your babies bathing and loving that blue in the previous bathroom and I can see the teens loving the dreamy and practical cool look of the now. It turned more than Great, Gina. It turned out a Dream! A lovely one. Oh my goodness Gina, what a wonderful transformation! The bathroom is so bright and airy and sooo updated. 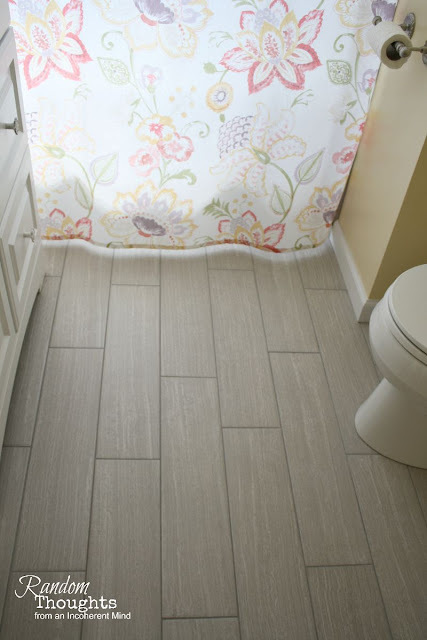 I love the tile floor, and also how you've used it in the bathtub/shower walls. The ladder in the corner is the perfect touch! It looks so pretty and cheerful. We are doing our bathroom in two years. We only have one, so you can imagine what it will be like. Gina, what a beautiful transformation! Love the new colors and the gorgeous tile. Just beautiful! Gina, this looks great! What a great makeover! I love the new colors and the tile is fantastic! It's such a cheerful room! It looks amazing Gina! WOW how fresh and pretty. Love the tile too. Gina, What a great transformation! 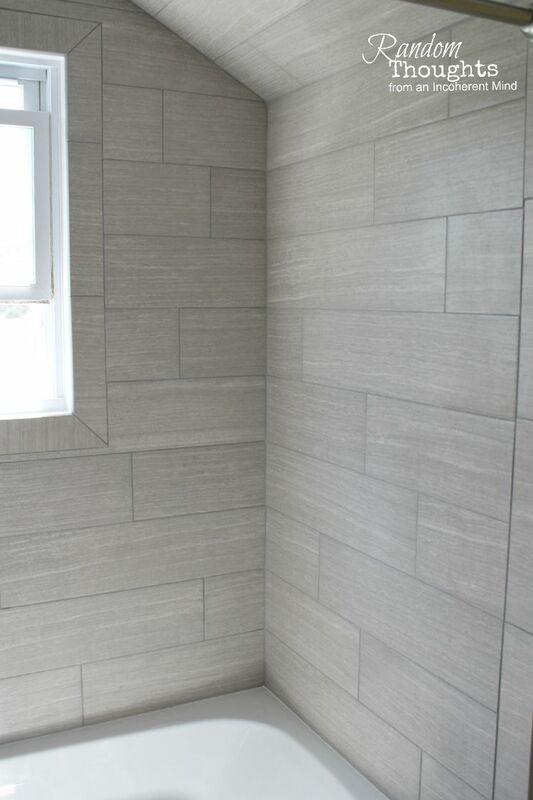 We had a similar tile in a previous home and loved it...so easy to clean. Enjoy your pretty new bathroom. Gina---this was a transformation just waiting to happen. You had a larger bath to start with and that's great! Funny how people rope themselves into color schemes that are so permanent, like the toilet and tile. We have baseboard water heat, too, so I knew our homes are about the same age. 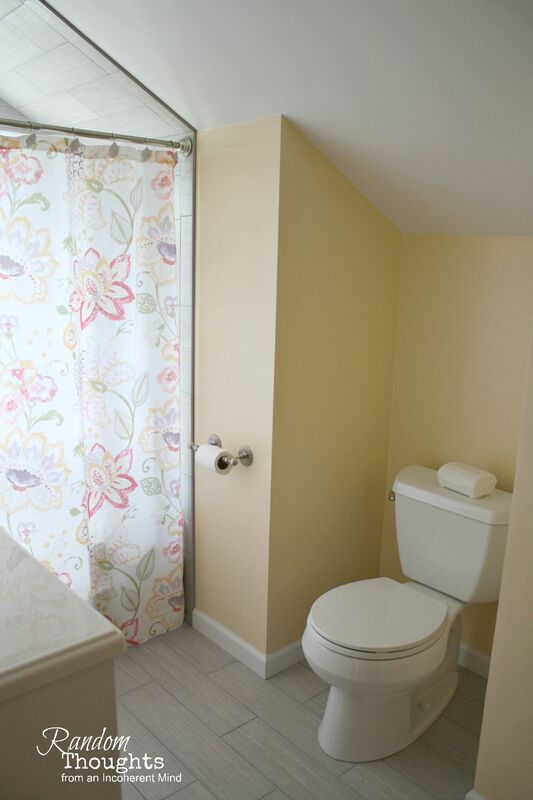 I love everything you did-the colors you chose definitely make everything look updated and fresh-love the shower curtain. Wondering about the floors...are they porcelain? We've picked out some floors for the lakehouse which are porcelain with the wood grain effect. So maintenance free and pretty. If so, good choice. I wrote about them in my post last week. Great job! Hope this summer has been good for you! Hi Gina, what a lovely transformation. I agree, that blue look needed to go. Now, you have created a beautiful bathroom. Everything looks so fresh and new. Enjoy and thanks for stopping by. Oh but Gina I bet all the plaster dust was worth it at the end. 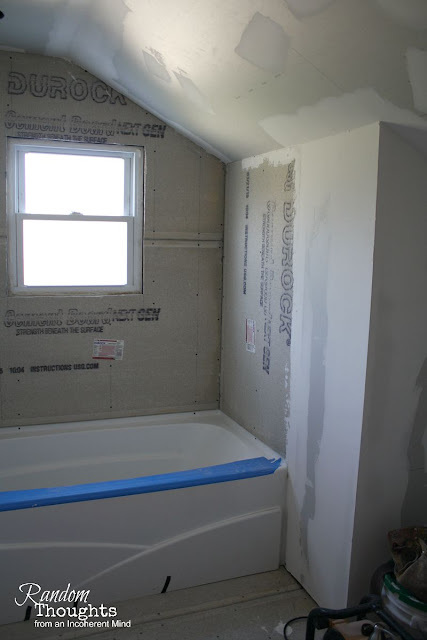 The bathroom looks great. I love, love, love the tile that lost like wood. Your space is now a pretty, updated and bright one...No cringing anymore ;-) Hope your summer has been a great one. Can you believe it is almost over? Aaah yes, so much better!! Your bathroom looks so crisp and clean. :D So pretty and I love the yellow! I am so sorry about the plaster dust. WHat a complete mess! I bet you'll be vacuuming that stuff up for weeks! But so worth it! I love the tile. I've seen in on HGTV (Flip or Flop) and I really like it. I agree. The new bathroom feels a lot more welcoming than the old clinical look. Warm, yet light wall colors go a long way to achieving that. 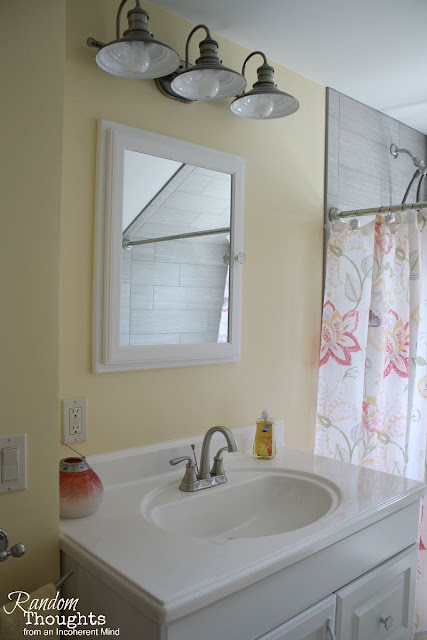 The sink still seems to function right, and remains unchanged from the bathroom remodeling in 2011. 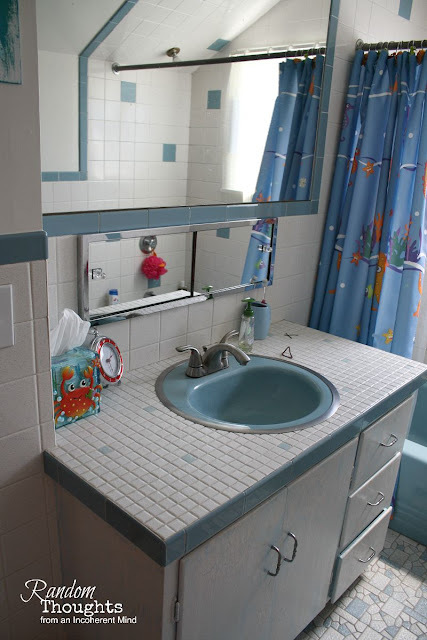 Sinks and vanities do help a lot in making a bathroom look organized and functional. Thanks for sharing! Wow Gina!!! Such a difference! It's beautiful. What's the name of the tile? We're about to redo our bathroom floor and I'd love to check on the ones you used. Great makeover!!! Amazing, oh my word girlfriend, holy cow WOW WOW WOW!!!!!!! I really can't believe it is the same room. /shakes head in astonishment at job well done. I seem to always be playing "catch-up" in blogland these days.....what a wonderful makeover, Gina! I completely understand that mess you are talking about, but I hope you see it as totally worth it now! The bathroom is beautiful now!